"I love my painting. I love doing it. My husband, Declan Apuatimi, taught me to paint. The designs are ones he taught me - he said, 'One day you will be an artist - you will take my place.' Now I am doing that. Painting makes me alive". The specific geometric designs that are the hallmark of Tiwi are art known as mulypinyini pwanga (lines and dots) and these form a common basis for many of the abstract designs found in the work of Tiwi artists including Jean Baptiste Apuatimi. Apuatimi began painting in the mid 1980s following the death of her husband Declan Apuatimi, himself a distinguished artist. During the start of her career she painted alongside Kutuwalumi Purrawarrumpatu (Kitty Kantilla) and similarities may be drawn between the refined minimalism that dominates both artists’ works. 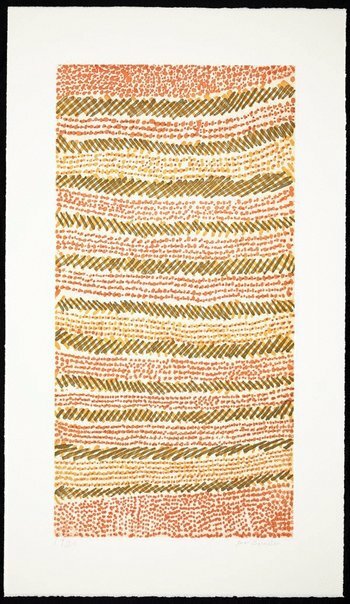 The majority of Apuatimi's career was spent working through Tiwi Design at Nguiu on Bathurst Island, working with both natural pigments on canvas and etchings on paper. 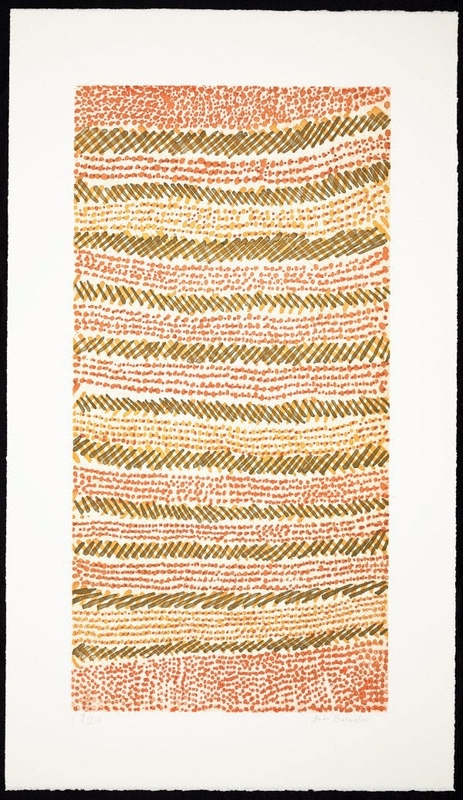 Her works are distinguished by their unique colouration derived from her experimentation with the mixing of natural red, yellow, white and black ochres to create a wider palette including greens, pinks, purples and blues, colours rarely used by other Tiwi artists. This print was made through Northern Editions Printmaking Studio, Darwin. This workshop has a long history of working with Indigenous artists through comprehensive collaborations that enable printmaking to be a viable alternate art form for Indigenous artists. The prints were exhibited at the Northern Editions Gallery in August 2012 and Apuatimi danced before the work to highlight the interconnected nature of dance, ceremony and art within Tiwi life. Signed l.r. beneath platemark, pencil "Jean Baptiste". Not dated.